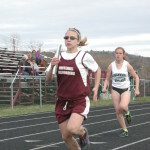 Morgan Winters finished in a tie for first place in the girls 100 meter dash at a recent track meet held in Whitehall. Before the season began, Justin Culligan, Whitehall’s track coach, talked about the competitive drive of Morgan Winters. Last Tuesday, members of the Wasaren League witnessed that drive first hand. The eighth grader finished in a tie for first place in the girls’ 100 meter dash and was part of a 4×100 relay team that finished second in a home meet against Waldorf, Greenwich and Cambridge. Winters ran the 100 meters in a time of 13.7 seconds, besting athletes several years her senior. She also ran the anchor leg of the 4×100 meter relay helping Whitehall finish in a time of 1:00.09. Winters also had a successful afternoon in the field events. She placed third in the girls’ long jump, clearing 13 feet, 6 inches and just missed the podium in the triple jump, finishing fourth with a jump of 28 feet, 10 inches. Rebecca Lavin had a strong afternoon a pair of second place finishes in the girls long and triple jumps as well as a fourth place finish in the 1500 meters. Caitlyn Sandford finished second in the high jump and third in the triple jump and Ashley Millett finished third in the girls shot put. The boys were led by David Greenough, Tyler Sweenor, and Brandon Steves, each of whom reached the podium in multiple events. Greenough won the high jump and finished second in the triple jump , Tyler Sweenor won the pole vault and finished third in the triple jump and Brandon Steves was second in the long jump and third in the shot put. Jason Morrill also reached the podium for Whitehall, finishing third in the discus. Whitehall’s track team had several strong individual performances at the Luciano Invitational in Hudson Falls on Saturday. Competing against athletes from 22 teams, Lavin was the only Railroader to reach the podium, finishing third in the girls’ long jump. Sandford finished in a seven-way tie in the high jump event, clearing six-and-a-half feet. Sweenor finished fourth in the pole value, Greenough seventh in the triple jump and Steves finished tenth in the javelin thrown. The team next competes at the George Muse Relays Saturday in Glens Falls.